More than 100 days into a Donald Trump presidency, it has become clear that his campaign promises have transformed into discriminatory public policies, and with an attorney general and a Justice Department focused on championing police while simultaneously criminalizing protest and political criticism, it is important that our greatest resistance movement change with the times. For Black Lives Matter, that means entering a new phase, one that, according to the Washington Post, is more focused on policy than on protest in the age of Trump. This shift in focus and tactics has the bonus effect of going further to debunk the myths and misconceptions about the origins, purpose and beliefs of Black Lives Matter and those in the movement. 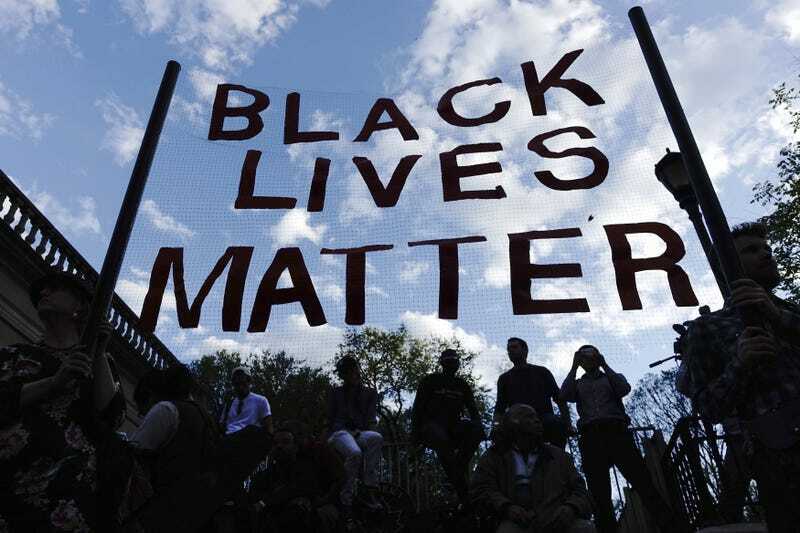 In a recent visit to the University of California, Santa Barbara, BLM co-founder Alicia Garza discussed and debunked three of the biggest and most damaging misconceptions about the organization and movement. Garza also outlined three “myths” of BLM: the notions that it is anti-police, anti-white and black supremacy. She said the U.S. needs “really courageous white people” to realize white supremacy does exist, adding that economic struggles are national concerns. According to what Garza told the Post, that action involves effecting change thr0ugh community organizing. The issue that galvanized the movement hasn’t subsided. So far in 2017, police have shot and killed 23 unarmed people, a higher rate than in 2016, when 48 unarmed people were killed all year. Both years, about one in three of those people has been black. Activists say they’re no less aware of those statistics than in years past. But like most of the political left, they were stunned by Trump’s electoral victory in November, and in the months since, they’ve grappled with the role of an anti-racism movement at a time when political threats to other groups—immigrants, Muslims and women—have gained urgency and pushed more progressives into the streets in protest. In interviews, more than half a dozen leaders in the Black Lives Matter movement said that last year’s election prompted renewed focus on supporting other minority groups as well as amassing electoral power to fight an administration that has pledged to roll back Obama-era efforts to reshape policing practices with a Justice Department that is “the leading advocate for law enforcement in America,” as Attorney General Jeff Sessions has put it. Those leaders—who hail from various factions of the decentralized movement of individuals and organizations that have, at times, clashed—said the reality of Trump’s presidency has forced a reconsideration of strategy. Stephen Zunus, a University of San Francisco professor who studies social movements, told the Post that Black Lives Matter’s transition from street protests to policy is not unusual, and it’s through such work that a movement’s priorities—like mandatory use of officer body cameras—can become national standards. Read more at the Washington Post and the Daily Nexus.